FSDF member Carrier Transicold will showcase its engineless technology at the CV Show at the NEC in Birmingham, April 24-26. Two highly innovative engineless solutions will be featured – the ICELAND TWINCOOL refrigeration unit and the Vector® 1550 E all-electric trailer system – which meet new emissions and noise regulations affecting the transport and logistics industry. The ICELAND TWINCOOL runs entirely on hydro-electric power generated by the truck’s ultra-clean Euro 6 engine, cutting emissions by removing the diesel engine inside the refrigeration unit. The system is powered by Carrier Transicold’s ECO-DRIVE GenSet, driven by a hydro pump connected to the truck’s power take-off motor. The hydraulic system drives a generator that delivers electrical power to the host unit. Visitors to the stand will be able to see how the engineless systems combine to supply continual, 100 per cent refrigeration capacity, even at the truck’s standard idle speed. Carrier Transicold’s all-electric Vector 1550 E trailer unit will make its CV Show debut. This proven technology harnesses electrical power either via a tractor fitted with an ECO-DRIVE system or through mains power while parked. By removing the cost and weight of the diesel engine entirely, the Vector 1550 E system presents a cost-effective way to meet tightening inner-city emissions regulations whilst helping fleets to become even more efficient. The Vector 1550 E unit’s all-electric architecture has been designed from the ground up to operate with minimal drop-off in performance versus a traditional diesel unit, offering up to 49 per cent more cooling capacity when compared to similar mechanical systems running on standby electric power. In addition, the Vector 1550 E unit’s micro-channel heat exchanger coils reduce refrigerant charge by up to 25 per cent versus standard heat exchangers, while the all-electric technology helps to improve refrigerant containment, potentially reducing leak rates by as much as 55 per cent over conventional belt-driven systems. With refrigerant prices rising, this is increasingly important for operators. Elsewhere on the stand, Carrier Transicold UK will showcase its improved telematics and fleet management system with full two-way communication functionality, allowing operators to remotely alter set points, operation modes, initiate defrosts or carry out pre-trip checks from a connected device anywhere in the world. 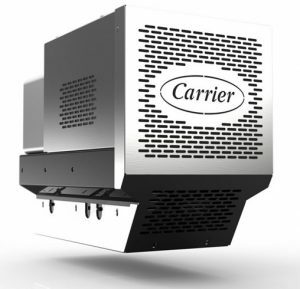 For more information on Carrier Transicold and its products and services, visit www.carriertransicold.co.uk.